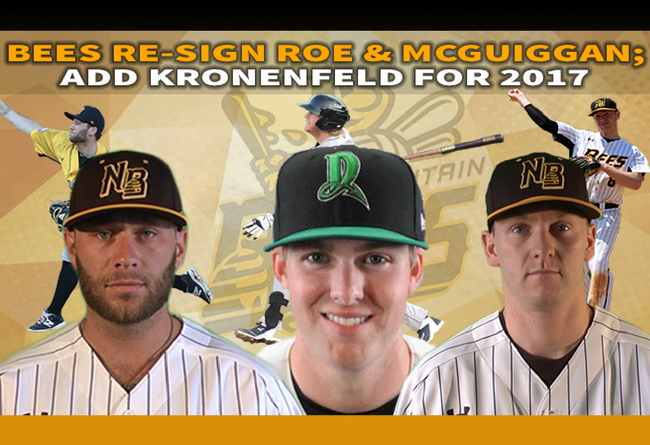 (New Britain, Conn., Feb. 15, 2017) - New Britain Bees team officials today announced that the team has re-signed right-handed pitcher Nate Roe and infielder Jake McGuiggan. In addition, New Britain has acquired outfielder/first baseman Paul Kronenfeld from the Schaumburg Boomers (Frontier League) for a player to be named later and signed him for the 2017 season. Roe, 28, re-joins the Bees after spending part of the Atlantic League offseason with the Adelaide Bite of the Australian Baseball League. The Plainfield, New Jersey native joined the Bees during July of last season as a free agent, appearing in 11 games for New Britain and tossing 56.2 innings. The right-hander enters his fifth professional season, and second in the Atlantic League after starting his career in the Can-Am League. Over 244 career innings, Roe has won 16 games and struck out 155 batters, primarily in a relief role. The 26-year old McGuiggan hit four home runs, including his first professional round tripper, and drove in 31 runs in 56 games with the Bes in 2016. McGuiggan, a native of Hingham, MA, appeared at shortstop, second, and third base in 2016, his first season in the Atlantic League. The Harvard University graduate spent his first season in the Can-Am league with the Garden State Grays, where he was teammates with fellow signee Nate Roe. Kronenfeld, a native of Greensboro, North Carolina, joins New Britain after spending his first season in independent baseball with the Boomers. Drafted by the Cincinnati Reds in the 25th round of the 2014 MLB Amateur Draft, the 6-foot-3, 225 lbs. crushed 10 home runs last season to go with 49 RBIs in just 76 games. In 194 professional games across three seasons, including two in the Reds organization, the 24-year old Kronenfeld has mashed 18 home runs and driven in 103 runs, splitting time between first base (70 games) and the corner outfield (103 games). The New Britain Bees are members of the Atlantic League of Professional Baseball, playing all home games at New Britain Stadium. Season Tickets and Mini-Plans for the 2017 season are available by calling 860-826-BEES (2337), online at NBBees.com, or by visiting the New Britain Bees’ Front Office.